Slim Fit Black Biker Distressed Leather jacket is a trendy new celebrity style leather jacket. This jacket was made with best quality leather. It is a black coloured, charming and highly attractive jacket with noticeable features. You can get our distressed leather jacket mens in Toronto, Paris, Washington and worldwide easily. 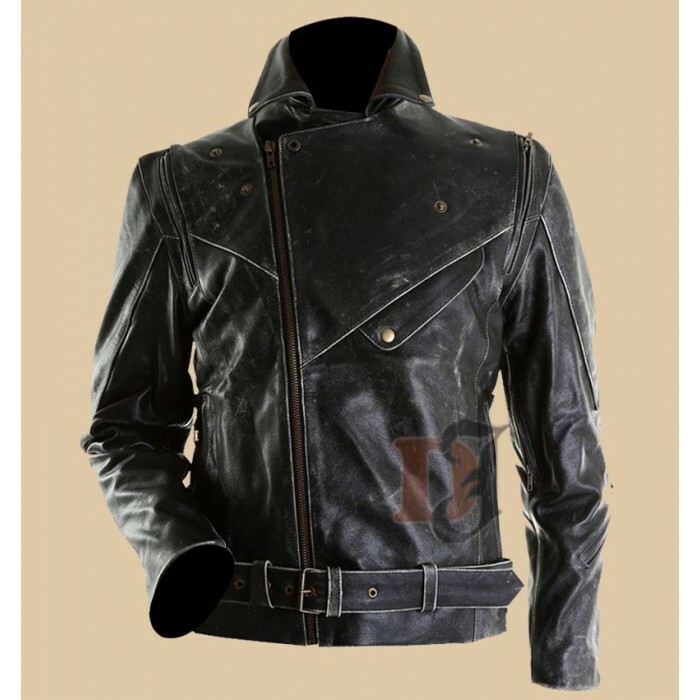 It is a uniquely styled leather jacket that can never be replaced by ordinary designs. It has got patched outer body and not only this but you will also see belted waist. This jacket was made out of 100% pure leather. Its inner polyester lining is very comfortable in winters. There is a belt on the waist of this jacket. Slim Fit Distressed Black Biker Jacket Distressed Leather Jackets have slim fit design and attractive black colour. This is 100% screen accurate jacket so you don’t need to worry about its quality and colour. Patched outer body gives it a new way of fashion. It has a front YKK zipper followed by t a wrapping belt around the waist.